The Charles Tillman era has come to an end in Chicago as the creator and master of the “Peanut Punch” made his windy city departure official, inking a one-year deal with the Carolina Panthers. The signing marks the end of Tillman’s 12-year stay in Chicago, which included two Pro Bowls and a Super Bowl appearance in 2006. The move will reunite Tillman with Panthers coach Ron Rivera, who ran the defense in Chicago from 2004-2006. While Tillman will go down as one of the best defensive backs in franchise history, the last two seasons have been frustrating for the veteran. A torn right triceps two seasons ago kept Tillman out eight games and he went on to miss all but two games of last season after suffering the same injury. The truth is, everything started to change when Lovie Smith was fired at the end of 2012. That season was also the last for Brian Urlacher, whose tenure with the Bears came to a rocky end when his agents proposed a two-year contract for $11 million to the Bears, who came back with a take-it-or-leave-it deal of one year at $2 million that Urlacher decided to leave. To call the break up between Urlacher and the Bears unfriendly would be an understatement, and with the hiring of Marc Trestman in 2013, the Bears marched out two of the worst defenses in franchise history in consecutive seasons. The defense never truly believed in Trestman or defensive coordinator Mel Tucker, who failed to provide the team with any kind of defensive prowess or identity. And while it is easy to focus on the bad ending with Urlacher, the unrest with Briggs last season and the injuries that have plagued Tillman the last couple seasons, it is important to not only acknowledge but also to celebrate the great Bears teams on which they played significant roles. The defense carried the team during Tillman’s time in blue and orange, with the defense priding itself on forcing turnovers and scoring points. It wasn’t just one of the team’s strengths, it was a necessity. With struggling offenses led by Rex Grossman and Kyle Orton, the Bears relied on defense to win games and they consistently came through, often scoring more points on defense than on offense. This defense was not as good as the ’85 Bears or even the ’63 Bears, but they did lead a team to a Super Bowl. It was a special team and Tillman will no doubt be remembered as one of the pillars of that group. Through all of the drama of the last couple seasons, Tillman has remained a consummate professional. He was not only a hero on the field, but in the community as well. The Charles Tillman foundation has given more than $1 million to families in need. Tillman won the NFL Salute to Service Award in 2012, and in 2014 received the Walter Payton NFL Man of the Year award. 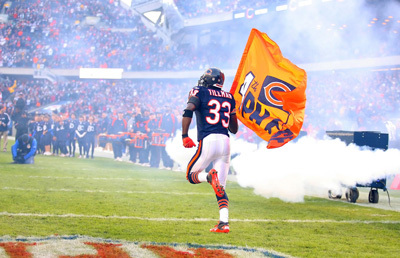 Letting Tillman walk was probably the right decision for the Bears, who are trying to remake their defense, but his leadership will be missed. A new era is starting in Chicago. How this next chapter will look has yet to be seen and who will lead them forward is still a question mark – but hopefully they can learn from someone like Tillman, who always led with passion, dedication and class.